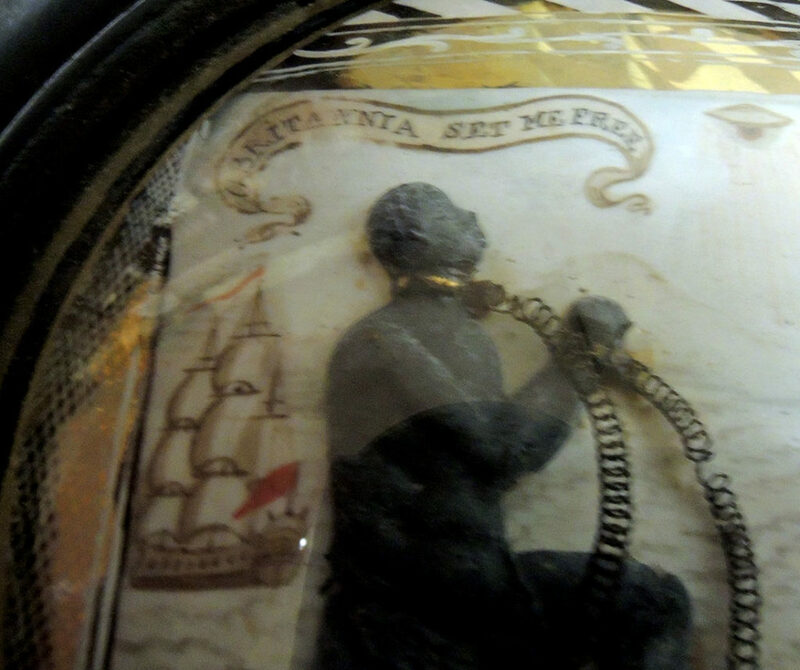 Thanks to Steven Knowlton, Librarian for History and African American Studies, the Graphic Arts Collection recently acquired this oval framed plaque with a wax figure of a crouching slave in chains appealing to the representation of Britannia, with “Britannia set me free” lettered above the slave and a ship in background. The interior measures 90 by 90 mm, painted on ceramic or ivory with gilt mount, all in a contemporary turned wooden frame. [Great Britain, ca. 1830]. The image adapts the iconic design of the crouching figure with the motto “Am I not a man and a brother” first produced as a jasperware medallion by Wedgwood in 1787-88. The formation of Thomas Clarkson’s Committee for Effecting the Abolition of the Slave Trade in 1787, “marked the transition of what had hitherto been the Quaker cause of abolition into a national, even an international movement. The emblem of the campaign–designed by the master potter Josiah Wedgwood, a committed supporter–was an inspired piece of propaganda, worthy of the Roman Church, or of a modern political party” (Thomas). The image had an immediate impact–women wore the medallions as necklaces or transformed them into bracelets, pins, or brooches to identify themselves with the abolitionist cause. The image also appeared on the title-page of works written in support of the abolitionist cause. After Wilberforce’s Bill to abolish the slave trade finally passed in 1807, activists turned their attention to the abolition of slavery and the image of the of the enchained, crouching slave was adapted for a new use. 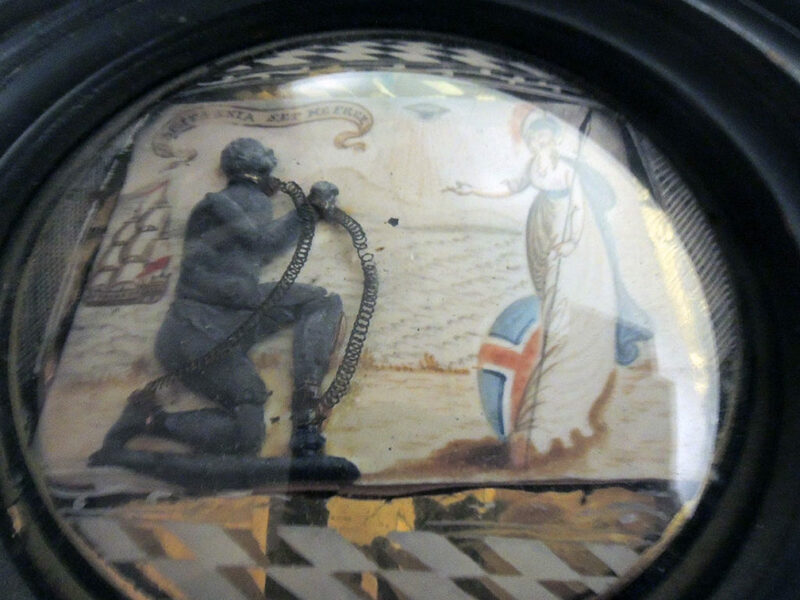 Now the image came to symbolize slavery generally and in the framed plaque, the crouching slave implores Britannia, a personification of the British nation, to set him free. The ship in the background may be a slave ship, and if so would allude to the earlier triumph of the campaign to abolish the slave trade and hint that a similar result awaits the anti-slavery campaign. In the sky between the motto “BRITANNIA SET ME FREE” and standing Britannia, is the ever-open-eye, which symbolises the omniscience of God. The symbol reminds the viewer that God knows of all the injustices perpetrated by man and subtly suggests that the viewer is complicit in the injustice if he or she doesn’t act against it. There are a number of different versions of this wall plaquette. 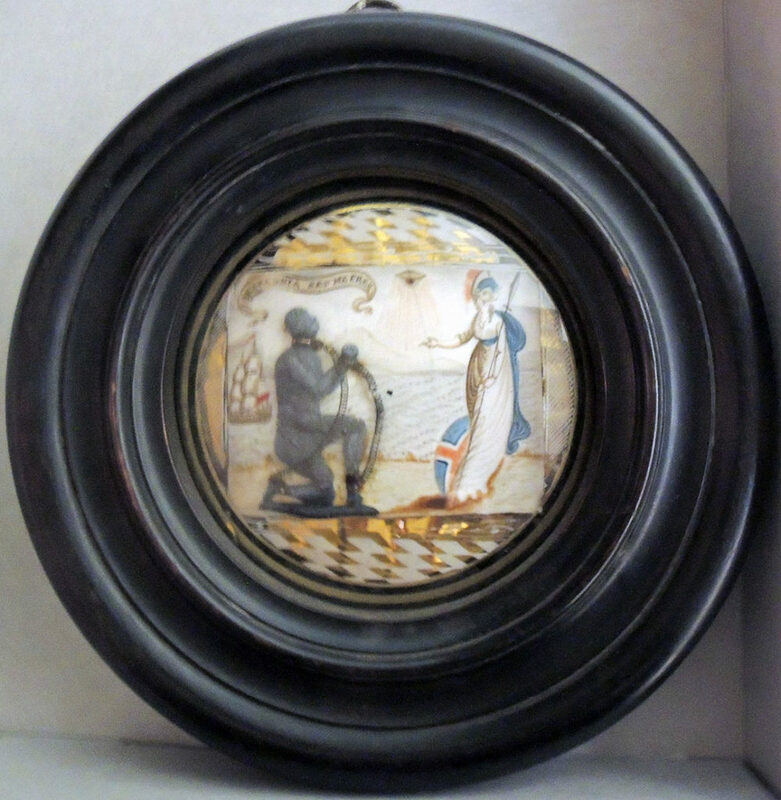 In one the frame is alabaster rather than wood–see the example residing at the Hull Museum [accession number KINCM: 2006.3747]. In others the visual layout of the scene is slightly different i.e. in one the figure has a white loincloth and the motto is more circular. The wall plaques were produced up until parliament passed the Abolition of Slavery Act in 1833. See also: Hugh Thomas, The Slave Trade, London, 2006, p.492. This entry was posted in Acquisitions, Museum object collection on October 3, 2018 by Julie Mellby.